Before cooking, bright green. Photo courtesy SpoonForkBacon.com. The shishito pepper is a relative newcomer to American cuisine. Finger-shaped, slender and sweet (not hot), it is growing in popularity as a snack, blistered on the stove top or grill. The shishito is named after its shape: The tip of the chili pepper was seen to resemble the head of a lion (shishi) and the word for chile is togarashi. Combine the words into shishitogarashi, which is often shortened to shishito (pronounced she-SHE-toe). Bred in Japan, this East Asian variety of the New World Capsicum annuum, like many chiles, is harvested when green. It would turn red if left to ripen on the vine (that’s the difference between green and red jalapeños). While shishitos are mild, every so often a hot one will surprise you. 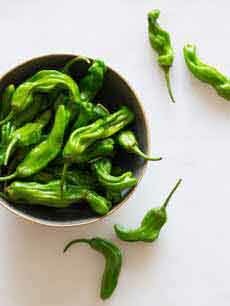 We found one estimate that heat can occur in one out of every ten chiles, the anomaly attributed by one botanist to “stress on the vine.” Think of eating shishitos as a fun game, “Shishito Roulette.” The winners gets an extra beer! The shishito is very similar to the Spanish padrón chile, in both looks and flavor. So if you can find the latter but not the former, use the information below and cook away. Where to find them? We found ours at Trader Joe’s, and have also seen them at farmers markets. If you garden, you can grow your own. If you can make roasted or charred vegetables of any kind, you can cook shishito peppers. Poke a tiny hole in each chile so they don’t burst from the build-up of hot air inside, or skewer them for grilling. We used a cake tester to poke a hole in the bottom cleft of each chile, although it won’t be visible after cooking so you can poke it anywhere. Sauté the chiles in oil in a hot pan on the stove top, under the broiler, or on a grill. We used canola oil with a splash of dark sesame oil (it’s a strong flavor and you’ll want just a hint). 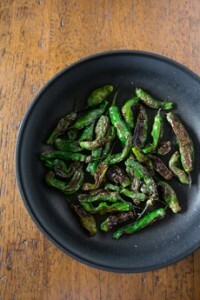 Turn the chiles frequently until they are blistered all over, 10 to 15 minutes. Because the walls of the shishito are thin, they cook quickly. When cooked, toss with a bit of salt and a squeeze of fresh lemon juice. You can also roast them in an oven or toaster oven. To eat, pick up a chile by its stem (but you won’t want to eat the stem). If you want to be elegant, use chopsticks or a fork. Enjoy while hot; as they cool, the chiles lose their crispness. If you want to add some spice, the ideal one is Japanese 7 Spice, shichimi togarashi. It’s a blend of black and/or white sesame seeds, dried nori seaweed, hot red pepper, ginger, orange peel and other ingredients such as hemp seed, poppyseed and white pepper. You can blend your own or buy it. Appetizers and sides. Shishitos are popular in Japanese cuisine as appetizers, like edamame. Tempura. Serve as a tempura snack or as part of a tempura entrée. With a beer. A match made in heaven. With a yogurt dip. Blend 1 cup plain Greek yogurt, 3 tablespoons Dijon mustard and 1 to 2 teaspoons Sriracha or other hot sauce. Sandwiches. Add a cooked shishito between the bread of a grilled cheese sandwich or pannini. Breakfast. Slice and add the cooked chiles to an omelet or scrambled eggs, a good use for leftovers that are no longer crisp. Side. Serve in medley with other roasted vegetables. Cooked: delightful! Photo courtesy Nutmeg Granny, who sautés her shishitos in coconut oil. Here’s her recipe. Chiles were “discovered” in the Caribbean by Christopher Columbus, who called them “peppers” (pimientos, in Spanish) because of their fiery similarity to the black peppercorns with which he was familiar. However, there is no relationship between the two plants (or between chiles and Szechuan pepper, for that matter). “Pepper” is wrong, but in the U.S., it seems to have taken over. Some people use “chile pepper,” a bit of a correction. The term “pepper” is not used in Latin America. There, the word is chili, from chilli, the word in the Nahuatl language of the Aztecs. Here’s more on the history of chiles. Is It Chile, Chili or Chilli? The original Nahuatl (Aztec) word is chilli. The conquering Spanish spelled it chile. In the U.K., chilli is the popular spelling. In the U.S., many people use chili, a seeming middle ground between chilli and chile. The choice is yours. We choose “chile” because it’s the spelling by which Europeans were introduced to the chilli. How many types of chiles have you had? Check them out in our Chile Glossary.